If you are lucky enough to have the space for a pond in your front or back yard, you know just how serene and and beautiful it can be. It will be admired by all your visitors for both its aesthetics and pond fish alike. Ponds can include a variety of different fish, but the most common are Koi fish and Goldfish. Other pond fish varieties include Shubunkin, Mosquito fish, Bitterling fish, Sarasa Comet, American Flagfish, and others. Whichever you choose for your pond, you most certainly will at least have koi and/or goldfish. Ensuring the right conditions are provided for your fish is of the utmost importance. Part of those conditions are water quality, treatment, filtering, oxygen, and food. 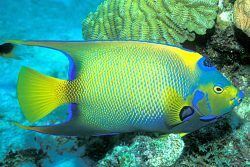 Each condition has their own key factors and will require special care to make sure that your fish stay healthy and happy. Food is one of the most important parts to keeping your pond fish alive, especially your beloved and beautiful koi fish and goldfish. 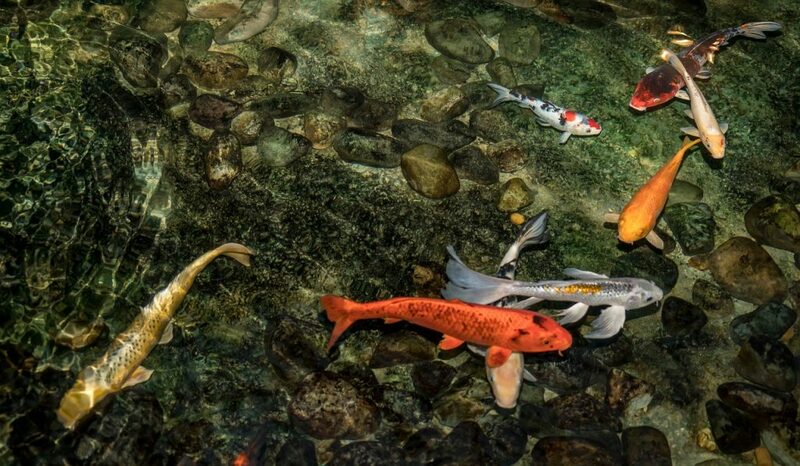 The majority of your pond fish can eat the same diet, however if you have fish other than koi and goldfish and would like to verify this, please consult guides specifically for those types. Included in this list of the best foods for your pond, koi, and goldfish are the options we feel will give your fish the correct ingredients, nutrients, vitamins and minerals to promote healthy and long lives. The food will give your fish energy and color vibrance, providing the best value for your investment. We want your fish to be as beautiful or even better than the day you got them. This list is split into two categories. The first category is for your summer feeding months and will be the majority of the food you will buy and feed. These foods will provide everything they will need when the water is above 50 degrees Fahrenheit (10 degrees Celsius). The second category is for your fall and spring months and when the water temperature is between 50 degrees Fahrenheit and 39 degree Fahrenheit (10 to 4 degrees Celsius). Food fed during those colder months needs to be formulated specifically for your fish’s slower metabolisms due to the colder water temperature. When the water temperature is below 39 degrees Fahrenheit (4 degrees Celsius) you should not feed your pond fish. Starting off at number 1, Tetra Pond Koi Vibrance Floating Pond Sticks are clearly one of the best options for your pond fish food, and meets the needs for you koi fish food and goldfish food. These sticks are soft and float which is exactly what your pond fish want to eat. They are easy to digest and won’t cloud the water for your koi fish. Your Koi and Goldfish will get all the nutrition they need as these floating pond sticks offer a highly nutritional diet. This food will also help to bring out the beautiful and vibrant colors of your Koi, especially for yellows and reds. Tetra Pond Koi Vibrance Floating Pond Sticks offer you a one stop solution for your pond fish food needs. These are great for during the warm summer months and will soften up enough for your young fish to eat as well. While the yellow and red color enhancement will truly bring out the beautiful colors of your fish, if you have white fish it will turn them a hint of yellow, just something to be aware of if you want to ensure your Koi fish colors stay the same. The color will go back to normal after a few months if you switch to a different food. TetraPond Pond Sticks provide a premium formulated nutritional diet for pond fish, koi fish, and goldfish of all sizes. These sticks will float and falso have a hollow center which helps promote healthy digestion. They are a great option as a daily diet and will provide your fish with energy, health, and a long stress free and happy life. TetraPond Pond Sticks contain vitamins, healthy protein, needed fats, and fiber for digestion. These sticks were made to ensure your water stays clean and healthy for your fish and long as you ensure that you feed the right amount, as overfeeding could lead to more waste in your water. Hikari Gold Pellets Pond Fish Food is a nutritionally balanced formula that has been fine tuned over the years of their koi breeding program. These pellets provide your koi with color enhancing and growth ingredients, that can be used as a daily diet for all of your pond fish including goldfish. This food will ensure your fish are healthy and happy. Hikari Gold Pellets Pond Fish Food are formulated to float and will ensure that your pond does not get cloudy and dirty, assuming you do not overfeed. They can be fed to almost all size fish in your pond and can be given to smaller and younger ones as well. These pellets are a great option for your fish pond. Kaytee Koi’s Choice Premium Fish Food provides necessary vegetable and animal proteins to ensure your pond fish, koi fish, and goldfish get the required nutrients to live long healthy lives. This floating pond food if great as koi fish food and goldfish food, meeting the nutritional requirements for both. They are also highly digestible leading to less waste and cleaner pond water. The high amount of protein in this food helps growth, color, longevity, and overall health of your fish. It will also not could your water. 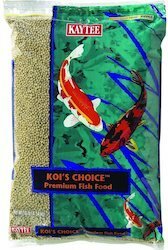 Kaytee Koi’s Choice Premium Fish Food is a good choice for any backyard pond and is nutritionally complete. The majority of the food will float, but you might find that if your fish don’t eat them quick enough they tend to sink a faster than the other food options on this list. You can alleviate through correct feeding and ensuring that you don’t overfeed. 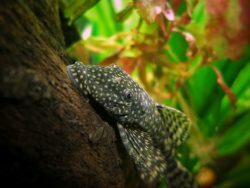 They also tend to be a bit larger food and so might not be the best option for younger fish while they are still growing to full size. Overall a good option with some key things to keep in mind. Hartz Wardley Pond Ten Floating Food Pellets provide a nutritionally balanced diet for your koi or goldfish. These pellets have been formulated for all of your pond fish, not just koi and goldfish, so if you do have other varieties or species in your pond, these pellets are a good option. It will provide them with energy to keep them happy and healthy. They are highly digestible and offer a nutritionally packed daily diet. Hartz Wardley Pond Ten Floating Food Pellets have a protein to fat ratio that supports growth and also helps to keep the pond water clean. Too much protein and your pond water could become dirty and unhealthy due to excess waste. These pellets are quite large so smaller and younger fish might have a hard time eating them. Keep this in mind when deciding which foods you choose. 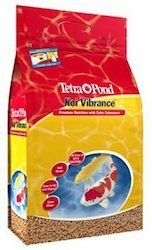 TetraPond Koi Growth Food comes in last on our list, but is still a very good option for your pond, goldfish, and koi fish. These soft sticks offer a high protein daily diet to ensure that your fish grow well and to their full potential. They are specifically formulated for young fish to ensure they grow due to the high protein. 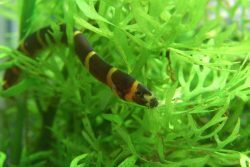 They are also recommended as a late spring and early summer food since that is when you will have the majority of your young fish. These can be fed throughout the summer, but on of the other options on the list might be a better option for you. 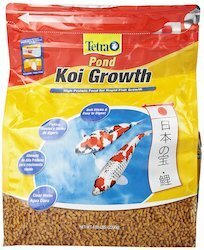 TetraPond Koi Growth Food will really get your fish going wether they are young or it’s late spring and early summer. Not only do they have high protein, as mentioned before, but they include nutrients, vitamins, fats and fiber to ensure your fish will be getting everything they need along with easier and healthier digestion. TetraPond Spring & Fall Diet Floating Pond Sticks are a great option for feeding your pond fish, koi fish, and goldfish in the fall and spring when the water temperature is between 50F and 39F (add Celsius). These sticks offer vitamin enriched wheat germ which helps to promote easy digestion at lower temperatures. They will also float and not cloud the water as long as you do not overfeed your fish. 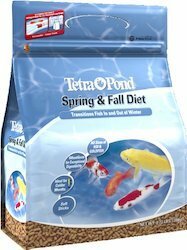 TetraPond Spring & Fall Diet Floating Pond Sticks will help to keep your fish happy and healthy during the time when the water starts to get cold and their bodies and metabolisms slow dramatically. These should be used as a daily diet during the months and temperatures mentioned. Encore Spring & Fall Koi Goldfish Food is another great option for feeding your pond fish during the fall and spring months and when them temperature if between 50F and 39F. This food offers an ingredient list packed with vitamins, minerals, and color enhancing properties. They help to bring out the best in your goldfish and koi fish, and ensure a happy and stress free time during the colder water months. 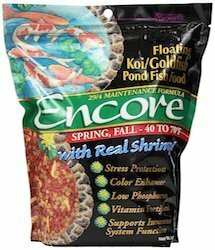 Encore Spring & Fall Koi Goldfish Food offers a low phosphate and low nitrate formula which helps to prevent cloudy water. The ingredients also include dried shrimp which will be a fan favorite by your koi. Just don’t expect many shrimp as it’s mostly small pellets. Should be used as a daily diet during colder months and colder water and will provide your fish with immune supporting nutrients. The information found throughout this guide should provide you with everything you need to keep your beautiful pond fish happy and healthy. Whether you need summer or spring and fall food, you should be able to find the best options available on in this guide. Regardless of which you choose, we only show the brands and varieties we recommend. Leave a commend below letting us know which you use and some of your great success stories.